Just what I needed!!! I'm handicapped and depend on help to grocery shop and hate that helper had to carry in groceries but now she can just load up the wagon to take into home. You guys are the best!! It is a little heavy but I can pick it up when closed and I'm 70. Thanks for all that you offer and the deals. With a large holding capacity, several convenient features, and the ability to fold up for easy storage, ALEKO's Multipurpose Utility Wagon will lighten the load of outdoor projects and recreational activities. 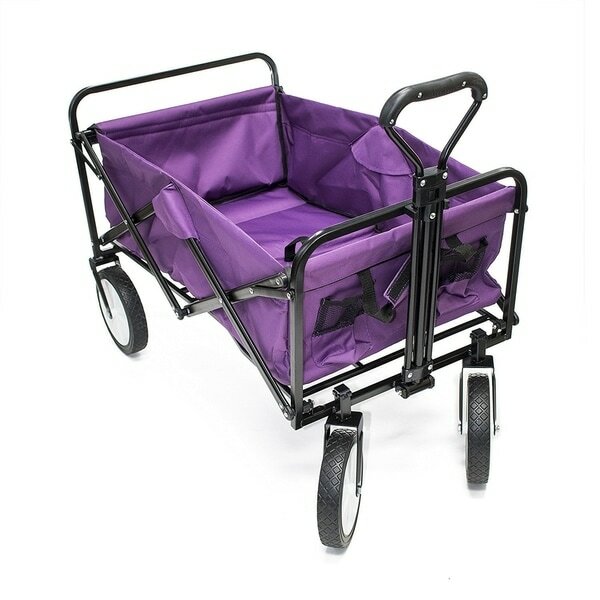 This folding wagon is a great companion to household projects, sporting events, picnics, concerts and festivals, days at the beach, car camping, fishing, gardening projects and more. The heavy duty frame and the durable polyester fabric is made to withstand years of wear and tear. Two mesh cup holders attached to the front of the wagon provide a convenient place for drinks and other items you want to access quickly. The two front wheels rotate to provide smooth, unhindered movement and a tighter turn radius. Maneuver the wagon with ease using the soft, rounded handle, which provides extra comfort when pulling heavy loads or navigating difficult terrain like sand and rock. The retractable handle can be adjusted to your preferred length. This fully collapsible wagon can be popped up and used in mere seconds--simply unfold it, lock it in, and go! I just received this wagon today. Pulled it out of the box, unlatched the velcro handle and pushed down and it opened up very quickly and easily. I then just pulled the handle in the middle to fold it up quickly and easily. Then I latched the velcro handle and put it away. I know this will be an easy way to carry things from my car to wherever I go. Great price and great quality. This folding wagon is the best! It is very sturdy and folds up easily and quickly. The wagon is pretty large and holds a lot of items for the beach, I highly recommend it. Oh my goodness, this little wagon was one of my best investments. Just moved my daughter back to college for her 2nd yr. It was so much easier this time since we have the wagon. It holds so much stuff. For instance, one load we had her fridge, a couple of tubs and her microwave 😊. We did learn that the bulk of the weight needs to be in the back, or evened out. If most of the weight is up front, the wheels have a difficult time turning. Oh, and it folds up for easy storage too. This is an amazing wagon. With one pull it folds into an east to store wheeled item. It is extremely durable and can hold heavy items. I will be using this often. Jut receive my multipurpose Folding Utility Wagon. I love it . I am a single foster mom for over 37 years and this will make my life a lot easy bringing groceries in my apartment. Thank You. Great heavy duty wagon. Well definitely take on 150+lbs with no issue and the wheels are big enough where you can drag it along the pavement or on the trails. Easy to fold up too. Nice this is a heavy duty wagon. Love it!! This is my second one. I used the first one a lot and gave it away to a camp and bought another one. The first one survived a year of teenage boys at camp. It finally broke after the yet another ride down a large hill with one or two teenagers in it:) Not the purpose of it I know but the first one hauled luggage and belongings AND served as the ride down the hill for an entire year of teens!! Love my purple one. I'm hanging on to it!! Perfect for me! I work and deliver groceries and this wagon is perfect when its a larger grocery order. It holds a lot and makes it so much easier for. I also use when going to the local parks with my kids. I load it up with snacks, drinks, toys, everything for a fun day at the park. Sturdy, easy to set up and to fold. Easy to maneuver. A little heavy. Plan to take it to the beach with my 2 year old granddaughter and all her stuff. I must say The quality is OK. Folded up it wont stand on its own - but I am mist annoyed that you can now buy the same item for over 40% less at the big box stores. Love this cart. I moved to an apartment with a carport and this cart really helps in combining emptying my car into less trips. It's very sturdy and the purple color is vibrant & fun. Finally! I have a way to haul things around! We are going to use this for girl scout roaming cookie sales! It is very sturdy and easy to fold and unfold. This folding cart is a MUST in all homes and cars. My daughter uses her to walk to the park with food/snacks/BBQ and always handy to get all your shopping from your car to your apartment. I bought this one because it is for my daughter whose favorite color is Purple. "How wide are the tires? trying to find out how wide across to figure out how well they would do when pulling weight in beach sand."